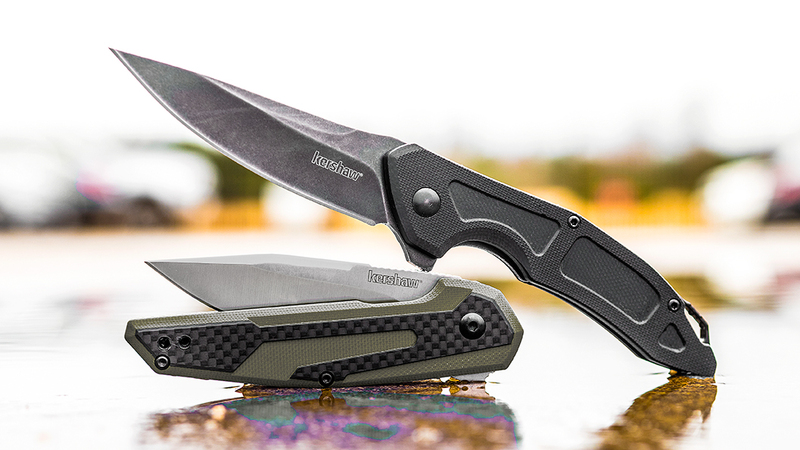 The Fraxion, from Kershaw and Danish custom knife and toolmaker, Jens Anso, is a proven hit—and a great choice for the knife user who prefers a contemporary look and a compact size. And now it's available with a BlackWashed blade and tan G10 handle with carbon fiber overlay. The black-and-tan Fraxion is a slim, sleek design that weighs in at a "Fraxion" of the weight of other comparable knives. The lighter weight is thanks to the streamlined design as well as to the light-yet-strong G10 handles with a handsome carbon fiber overlay. An inset liner lock secures the blade open during use while also helping keep down the overall weight and maintaining the handle's comfortable slimness. 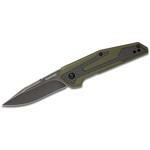 The clip-point blade features a top swedge and a good-looking BlackWash finish. 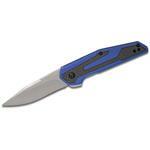 Built of 8CR13MoV stainless steel, the blade offers a sharp, long-lasting edge for day-to-day tasks. 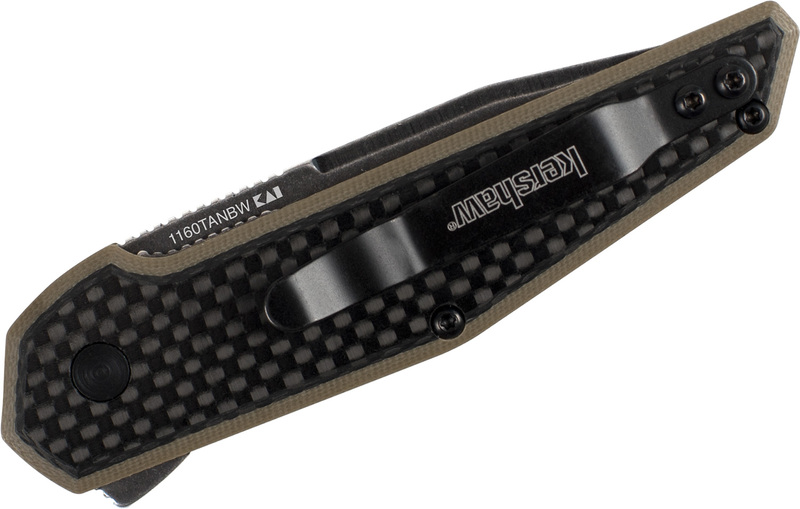 The Fraxion is a manual knife, but can be opened quickly, easily, and one-handed with the built-in flipper. For convenient left- or right-handed carry, the Fraxion is equipped with a reversible deep-carry pocket clip, enabling it to ride comfortably low in the pocket. Inset Liner Lock - A strip of stainless steel is riveted inside the knife's handle—most commonly when the handle is a lightweight material. This enables us to create a slimmer, lighter knife, while still providing the strength and security of a locking liner. First of all I purchased this knife from somewhere else but I have ordered from knifecenter many times and am always pleased with the service and they are the fastest knife site I've ordered from when it comes to shipping!On to the knife , the Kershaw fraxion is not in my usual price range of knives, I am a knife collector through and through, I own about a dozen other Kershaw knives and figured I'd give this one a shot.Definitely not disappointed, bearings and carbon fiber for under $30 is a no brainier to me, I expected this knife to be alot worse than it is admittingly I wish I would have known that this knife came in blue but that is nothing against the knife it's self. Action is smooth, all bearings roll freely in cage. Lock up is normal, no stick, detent is perfect, no stiffness at all. Pocket clip could have been a bit better, would like to see a smaller version of the zt 0562 clip on it instead but again just a personal preference. The only negative I can see is the grinds on mine are just slightly uneven. But it still apex's just fine.Blade steel is the standard 8cr13mov, takes a edge nice and easy but looses it just as easy, but that is a pretty standard blade steel on knives under $50. All and all I would say that If you are interested in this knife then just go ahead and pull the trigger! Great knife great supplier!!!!! !Stay sharpCheck me and my knives out on Instagram @nomoremrknifeguy89. 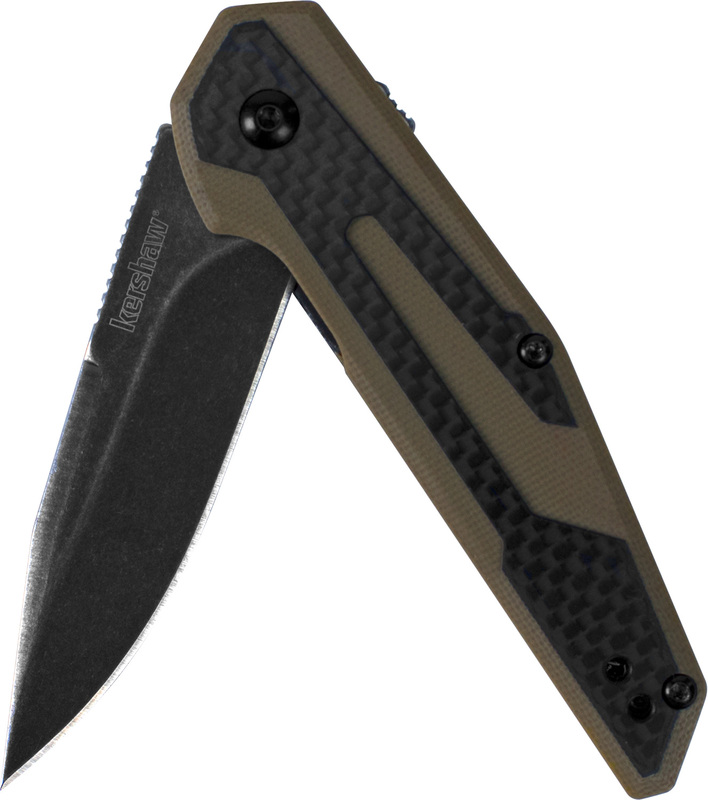 Hey, I wanted to share "Kershaw 1160TANBW Jens Anso Fraxion Flipper Knife 2.75 inch BlackWashed Clip Point Blade, Tan G10 Handles with Carbon Fiber Overlays" with you from KnifeCenter.